The Museum’s heritage space in the Jewish district, which opened in March 2015, is the best starting point to discover how Barcelona's Jewish community lived in medieval times. The Call preserves its name from the time when it was the home of the Jews of Barcelona, a people present in the city from ancient times and with a very active role in the urban community of the Middle Ages. The street plan of the medieval Jewish quarter is preserved, together with abundant documents in the city’s archives. The Museu d’Història de Barcelona’s centre in the Call, located in the former house of the veil weaver Joseph Bonhiac, covers the important role played the Jews in the city’s history and the splendour of their cultural legacy which has survived through time and has a universal value. The Call Major was the first specifically Jewish settlement in the city. It occupied the north-east quadrant of ancient Barcino, and many streets in the area conserve the same layout as when Barcelona was a Roman colony. The Call became a closed space, but in spite of that, the Jews did not live in isolation: they had houses and workshops outside the Call, and properties and agricultural land on the plain of Barcelona. By the early 13th century, the population of the Call had grown so much that the district became too small for it. Barcelona's Jewish community had also grown significantly after the arrival of Jews who had been expelled from lands belonging to the King of France. 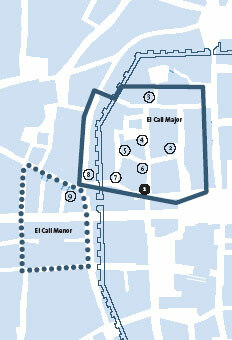 As a result, a new space known as the Call Menor was built outside the walled city. It was made up of five blocks of houses with a square and a synagogue. It is hard to imagine now what it looked like at that time, because the area has changed so much: the synagogue was turned into a church and a monastery, and when Carrer Ferran was built in the 19th century, the square disappeared. Generally speaking, there are few remains that have survived from the Jewish buildings, especially after medieval structures were transformed or demolished to build apartment buildings, when the city’s industrial growth in the 20th century called for new housing to be built. The first document mentioning the existence of a Jewish district in the city dates from the 11th century. Even so, Jews are known to have been living in Barcelona for up to two centuries before then. The Jewish community played an important role in contributing to the trade expansion of the city. The Jews had their own traditions and negotiated their own institutions with the king in exchange for guaranteeing that the community would pay its taxes. At first, relations between the Christian and Jewish communities were good: they owned joint businesses, and the count-kings granted Jews a number of important public positions, such as Royal bailiff, tax collector and ambassador. But then in 1215, the 4th Council of the Lateran adopted a number of measures against the Jews: their money-lending activities were restricted, they were prohibited from occupying positions of authority over Christians, and they were forced to wear identifying insignia. However, despite this pressure from the new ecclesiastical orders (and especially the Dominicans), the monarchy resisted fully applying these regulations, and the Jews continued to be an essential part of city life. But as the 14th century progressed, social coexistence deteriorated until in August 1391, an attack took place on the Call which led to the death of 300 of its inhabitants. The Call never recovered from that terrible episode, even though Jews continued to live in Barcelona, albeit in lesser numbers and with many of them having converted to Christianity. Even so, 100 years later they were all expelled from the lands of the Spanish monarchy. Concessions: 1,50 € for students under 29, over 65, and holders of Barcelona library cards, targeta rosa reduïda, large family cards and single-parent family cards.